Out of the Furnace is sure to thrust you into the depression, despite the use of Pearl Jam to not only open, but used to awkwardly close the film as well. Compelling performances bring this less than gripping tale to something resembling a sad and dark life. Christian Bale transforms himself once again into something almost unrecognizable as a Pittsburgh steelworker with that rare trait of accepting responsibility for his actions. Afleck, the good one named Casey, plays his little brother, a War Vet with PTSD and a hankering for fast money made by taking dives in underground fight clubs. It’s the wicked Harrelson who makes this ordeal of a film worth while though with his ultra evil performance as a New Jersey hill dwelling meth head and lord of the underground fight ring syndicate. He’s arguably more unsettling and creepy here as Harlan than he was as Mickey in Natural Born Killers. Points should be given to any film that has a lasting effect on you. Not sure what cowriter/director, Scott Cooper (Crazy Heart) was trying to say here. Maybe that wasn’t the point. Perhaps his aim was to subject his audience to a loathsome tale of struggle and pain. Maybe a commentary on the way we treat our vets? Not sure, but either way, the depression on the screen cant’t be shaken from your psyche for sometime after it’s concluded. Think Winter’s Bone and The Deer Hunter. 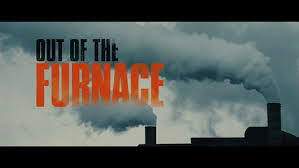 Out of the Furnace is on par with the former, but far shy of the latter. Posted on Saturday, December 7th, 2013 at 2:32 pm and is filed under Reviews.